Liner and Cruise Line History: Does Madona know that Eva Peron had two ships named after her? The Argentine cargo-passengers liners were called the MV EVITA and the MV EVA PERON. They were similar in design to the MV JUAN PERON. The ships operated from Argentina (South America) to Europe and the USA. The ships were streamlined and yacht like. They carried limited number of first class passengers and cargo. 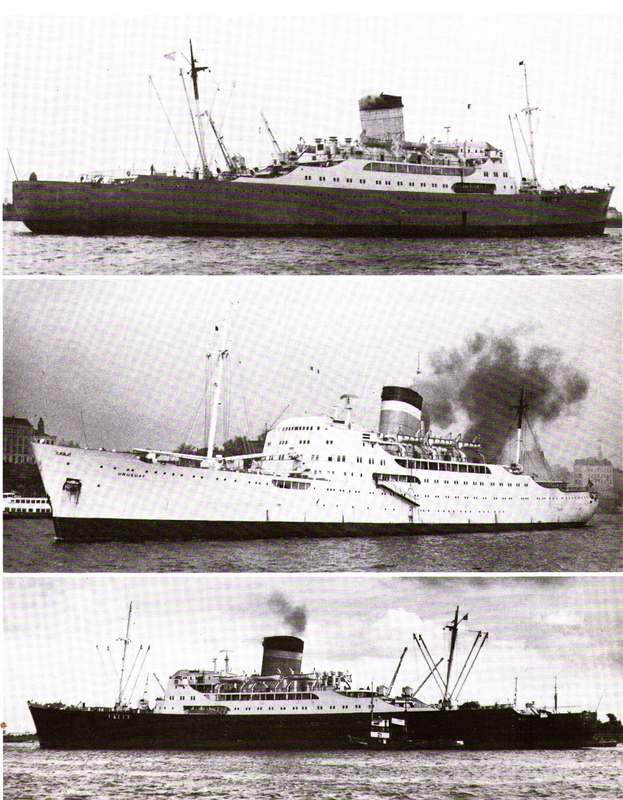 Three views of the MV EVA PERON (later renamed the MV URUGUAY). Cia Argentina de Nav Dodero’s EVA PERON was launched in 1949. Named in honor of dictator Juan Peron’s wife, the ship was 12,627 GRT, 530 feet in length and 71 feet in width, carrying 96 first class passengers with a crew of 145. The ship was very deluxe and used by a lot of Peron’s cronies. Her maiden voyage was from London to Buenos Aires and later from Hamburg to Buenos Aires. 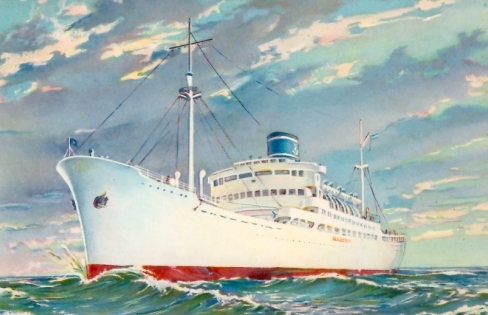 After the fall of the Peron government in 1955 the ship was named the URUGUAY. She was broken up in 1973. Argentina was the only South American country to operate long distance intercontinental ocean liners, although always with ships of moderate size and speed. While ruling Argentina, Eva Peron had dictator Juan Peron, her doting husband, name two-passenger ships after her. The Argentine liners were called the MV EVITA and the MV EVA PERON. They were similar in design to the MV PRESIDENTE PERON. The ships ran from Argentina (South America) to Europe and the USA. Last minute schedule showing the EVITA sailing from New York to Bunos Aires, poster for the Argentine State Line, matches given away aboard ship and playing cards. 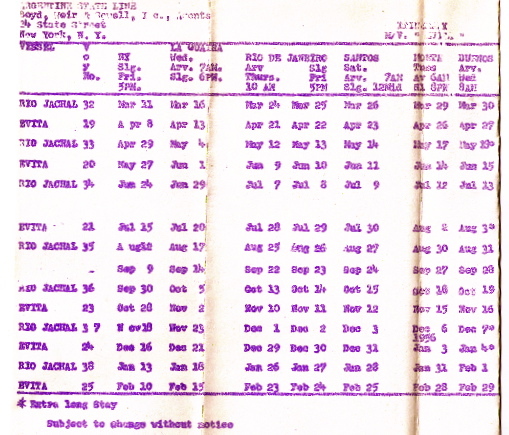 The schedule was inserted in the regular schedule because Peron’s government had given the ship a new name: EVITA. The Juan Peron influenced Compañia Argentina de Navegación Dodero / Empresa Lineas Maritimas Argentinas commenced Buenos Aires to London passenger voyages in 1949 with the newly built PRESIDENTE PERON and followed this in 1950 with the EVA PERON and the 17 DE OCTUBRE. Compañia Argentina de Navegación Dodero / Empresa Lineas Maritimas Argentinas commenced Buenos Aires to London passenger voyages in 1949 with the newly built PRESIDENTE PERON and followed this in 1950 with the EVA PERON and the 17 DE OCTUBRE. The Flota Mercante del Estado’s motorship EVITA (name adopted in 1952) was launched in 1949. She was one of two ships named after dictator Juan Peron’s wife: Eva Peron. The EVITA was 11,317 GRT, 550 feet in length and 65 feet in width. Carrying 116 passengers in first class, with a crew of 155, she operated on the line’s Buenos Aires-New York service. 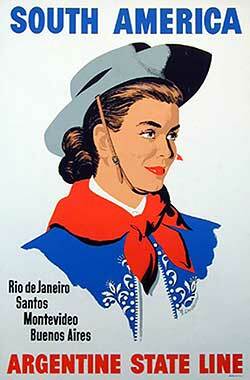 In 1955 she was renamed the RIO TUNUYAN when Peron’s dictatorship was defeated. She was refitted as a one-class vessel carring 372 tourist class passengers running from Buenos Aires to Hamburg. She was broken up in 1973. The same year, passenger services between Buenos Aires, Vigo, Amsterdam and Hamburg commenced. A service between B.A., Rio de Janeiro, Las Palmas, Lisbon, Barcelona, Marseilles, Naples and Genoa with southbound calls at Montevideo soon followed. After the fall of the Peron Government, the Dodero Line ceased operations and management of the fleet passed to Flota Argentina de Navegaceon de Ultramar (FANU). In 1962 FANU and the Flota Mercante del Estado merged to form Empresa Lineas Maritimas Argentinas (ELMA) who took over the passenger services. The Genoa route was discontinued in 1969 and passenger services to London in 1967 and the ships converted to cargo carriers. The Hamburg route was ended in 1972. 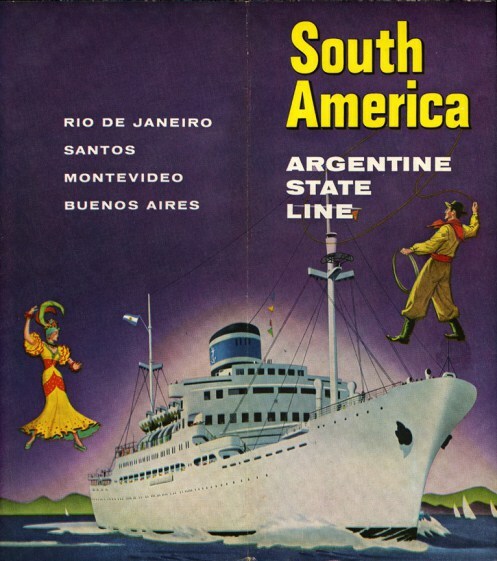 The Argentine State Line service from Argentina to New York operated between 1950 and 1962. 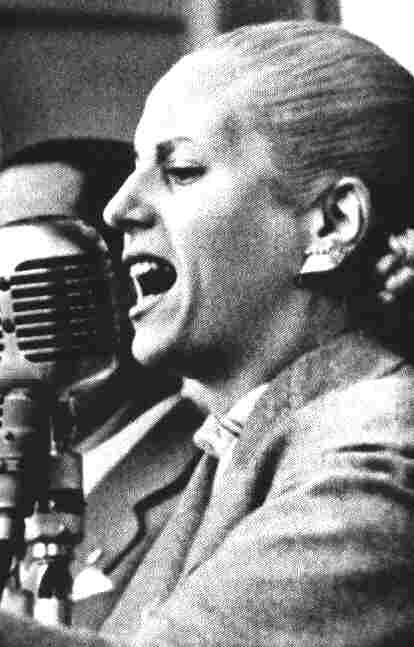 Between 1952 and 1953 the EVITA operated to New York from Buenos Aires. With the fall of the Peron government, any reference to Juan or Eva was removed. The EVITA was changed to the RIO TUNUYAN. 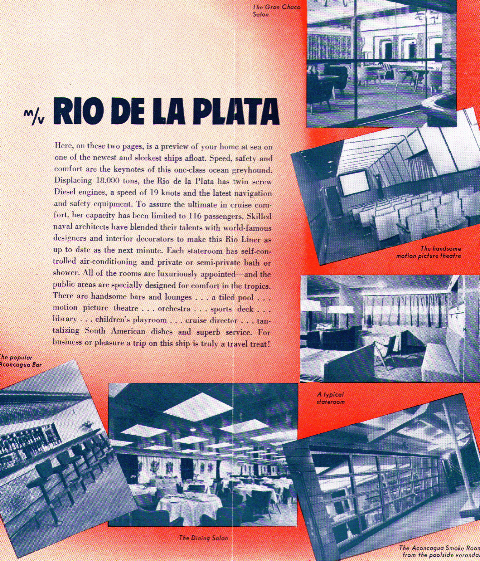 With the RIO DE LA PLATA and RIO JACAL the former EVITA held down the 43-day round trip from New York to Buenos Aires via Rio de Janeiro, Santos and Montevideo, returning via the same ports plus Trinidad and La Guaira (Caracas). Argentina was the only South American country to operate long distance intercontinental ocean liners, although always with ships of moderate size and speed. The Rio de la Plata, Rio Jachal and Rio Tunuyan held down the 41-day round trip from Buenos Aires to New York outbound via Santos, Rio de Janeiro, Trinidad and La Guaira (Caracas), with the homeward voyage stopping in Rio de Janeiro, Santos and Montevideo. The spacious facilities were designed to compete with Moore-McCormack Lines’ popular “Good Neighbor Trio” built in the 1930s. The air-conditioned accommodations included large staterooms with private or semi-private bath, a main lounge, smoking room bar, library, dining room and a tiled swimming pool and lido. The air-conditioned accommodations included large staterooms with private or semi-private bath, a main lounge, smoking room bar, library, dining room and a tiled swimming pool and lido. Cia Argentian de Nav Dodero’s PRESIDENTE PERON was launched in 1948. Named in honor of dictator Juan Peron, the PRESIDENTE PERON was 12,459 GRT, 530 feet in length and 71 feet in width, carrying 74 first class passengers with a crew of 145. This proved to be nearly two crewmembers to every passenger. Her maiden voyage was from London to Buenos Aires and later from Hamburg to Buenos Aires. After the fall of the Peron government in 1955 the ship was named the ARGENTINA. She was broken up in 1973.